Learning how to read a Snellen Eye Chart is fairly simple. 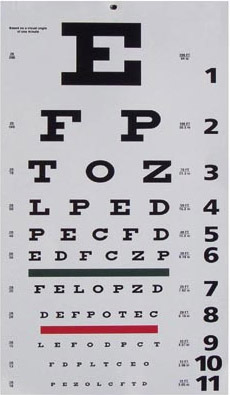 In order to understand the way visual acuity is determined, first one must understand what is called the Snellen Eye Chart. The chart starts with a large letter at the top, and as one follows the chart to the bottom, the letters decrease in size. The letters are called optotypes. Next, beside each row of letters on the left side are numbers that are similar to 20/40. These numbers are what the doctor and their techs use to measure visual acuity. The top number is how far away you are sitting from the chart, or how far way the chart is from you by a reflection. This top number is 20 as it represents 20 feet. The bottom number, or second number, is the distance that this particular letter can be seen by a person that has normal vision that isn’t impaired. This bottom or second number is always different and represents a distance in feet. When sitting in the chair for vision to be checked, one eye is covered. With that eye, one reads the Snellen chart starting from the top of the chart to the smallest line that can be seen. Let’s say you read the line above the 20/20 line but can’t read anymore. That would mean that if you look to the left at the numbers beside that row, you would see that you stopped at 20/30. This means that at a distance of 20 feet, you can see what a person with clearer vision can see a 30 feet, thus, making your vision 20/30 in that particular eye. The other eye will be examined the same way. This is a slight visual impairment, and generally, there may be no need for glasses at this point, however, specs could help with certain things depending on if you are myopic(nearsighted) or hyperopic(farsighted), and that would have to be taken up with your doctor. * Always consult with your Optometrist or Ophthalmologist if you believe that you have a visual problem and never make attempts to diagnose yourself. where could I buy a snellen chart? Previous post: What Exactly Is Astigmatism? Next post: Learn And Teach Patients How To Properly Use Line Bifocals!